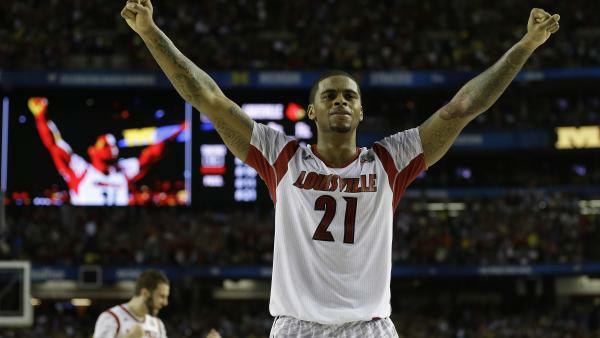 Louisville forward Chane Behanan celebrates after defeating Michigan in the NCAA basketball championship on Monday. It was the school's first basketball title since 1986. 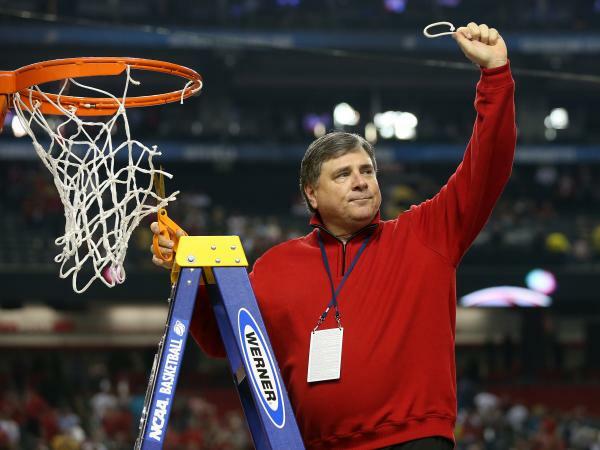 Louisville Cardinals' athletic director Tom Jurich is often cited as the reason the school has become a national athletic powerhouse. Louisville also fields some of the nation's best teams in other sports, like soccer and baseball. Why has this state-supported urban institution with a full-time undergraduate enrollment of 12,000 turned into a national athletic powerhouse? Men's basketball coach Rick Pitino and most others are quick to point to athletic director Tom Jurich as the reason. Pitino says Jurich has raised the university's profile in ways different from other schools, forging a strong bond with Louisville's corporate citizens. Jurich came to Louisville from Colorado State University 15 years ago. He's overseen the athletic department's growth into a profitable, $80-million-a-year operation. "A lot of times you're walking a tightrope because you need funds to build facilities. You need facilities to generate funds. It's a little bit of a chicken-or-the-egg type of situation, but he's really managed that extremely well," says Michael Smith, who covers college athletics for the national Sports Business Journal. But Smith says it's more than just about buildings. Jurich's hires are just as important. Those have included Pitino, women's basketball coach Jeff Walz, football coach Strong and men's soccer coach Ken Lolla, who led the Cardinals to the NCAA championship game three years ago. The financial windfalls from those sports have led to new or expanded facilities across the campus and the Cards' downtown arena. Jurich's colleagues say he has brought a "think big" attitude to the Louisville campus, and at a press conference last year marking his 15th anniversary on the job, Jurich said he's tried to surround himself with like-minded people. "You walk through our hallways, you see people bouncing off the walls. That's good. I like to be able to try to rein people in instead of trying to create an energy. If you have to create an energy, you got the wrong people," Jurich says. On Monday night, Pitino became the first coach to win a men's basketball national title at two different schools. The first one came at the University of Kentucky, the state's much larger flagship university, in 1996. One of Pitino's predecessors there once referred to Louisville's basketball team as "little brother." Jurich says it's a moniker he embraces today. "I want to be little brother. I want to be Avis. You know, I want it to be that 'we try harder' atmosphere. I want that around our department. I want people hungry for that," Jurich says. "But my ultimate goal is, I want little brother to be 6-[foot]-4, 285 [pounds]. And that's what I think we've been able to do." The University of Louisville will soon have new challenges. The school is joining the Atlantic Coast Conference, where the Cards will play the likes of Duke and North Carolina in basketball, and Florida State in football. On Tuesday night, the women's basketball team plays Connecticut in New Orleans. Copyright 2013 Louisville Public Media. To see more, visit http://www.prp.org/. Tonight in New Orleans, the University of Louisville is playing for another national championship in basketball. This time, the women's team will play Connecticut. We'll have more on that match-up in just a few minutes. But first, yesterday's big victory by Louisville's men's basketball team over Michigan. It's just the latest success for the school. And as Rick Howlett of member station WFPL reports, Louisville's athletics department is quickly becoming one of the country's most admired. RICK HOWLETT, BYLINE: Along Cardinal Boulevard on the University of Louisville campus last night, it was crazy. HOWLETT: Thousands of people like student Patrick Dugan celebrated the school's first basketball title since 1986. PATRICK DUGAN: It feels so good after 27 years, yes. HOWLETT: Louisville fans have had a lot to cheer about lately and not just basketball. In January, the football team upset fourth-ranked Florida to win the Sugar Bowl, and Coach Charlie Strong turned down a lucrative offer from the University of Tennessee to continue rebuilding the Louisville program. Louisville also fields some of the nation's best teams in other sports like soccer and baseball. So why has this state-supported urban institution, with a full-time undergraduate enrollment of 12,000, turned into a national athletic powerhouse? Here's men's basketball coach Rick Pitino. RICK PITINO: When we raise money and build facilities. We don't to it really with alumni, some we do. We're not who's who, like Harvard and Yale in the alumni world. We're just a blue-collar school that really supports each other. Pretty cool place, one of the coolest places I've ever worked. HOWLETT: Pitino and most others are quick to point to athletic director Tom Jurich as the reason. Pitino says Jurich has raised the university's profile in ways different from other schools, forging a strong bond with Louisville's corporate citizens. Jurich came here from Colorado State University 15 years ago. He's overseen the athletic department's growth into a profitable $80 million dollar a year operation. Michael Smith covers college athletics for the national Sports Business Journal. MICHAEL SMITH: A lot of times you're walking a tightrope because you need funds to build facilities; you need facilities to generate funds. So it's a little bit of a chicken or the egg type of situation, but he's really managed that extremely well. HOWLETT: But Smith says it's more than just about buildings. Jurich's hires are just as important. Those have included men's basketball coach Rick Pitino, women's coach Jeff Walz, football coach Charlie Strong, and men's soccer coach Ken Lolla, who led the Cards to the NCAA championship game three years ago. The financial windfalls from those sports have led to new or expanded facilities across the U of L campus, and the Cards' downtown arena. Jurich's colleagues say he has brought a think big attitude to the Louisville campus and at a press conference last year, marking his 15th anniversary on the job, Jurich said he's tried to surround himself with like-minded people. TOM JURICH: You walk through our hallways, you see people bouncing off the walls. That's good. I like to be able to try to rein people in instead of trying to create an energy. Once you have to create an energy it's - you've got the wrong people. HOWLETT: Last night, Rick Pitino became the first coach to win a men's basketball national title at two different schools. The first one came at Kentucky, the state's much larger, flagship university, in 1996. One of Pitino's predecessors at UK once referred to Louisville's basketball team as Little Brother. Jurich says it's a moniker he embraces today. JURICH: I want to be little brother, I want to be Avis. You know, I want it to be that we try harder atmosphere. I want that around our department. I want people hungry for that. But my ultimate goal is I want little brother to be six-four, 285. JURICH: And that's what I think we've been able to do. HOWLETT: The University of Louisville will soon have new challenges. The school is joining the Atlantic Coast Conference, where the Cards will play the likes of Duke and North Carolina in basketball and Florida State in football. For NPR News, I'm Rick Howlett in Louisville. Transcript provided by NPR, Copyright NPR.